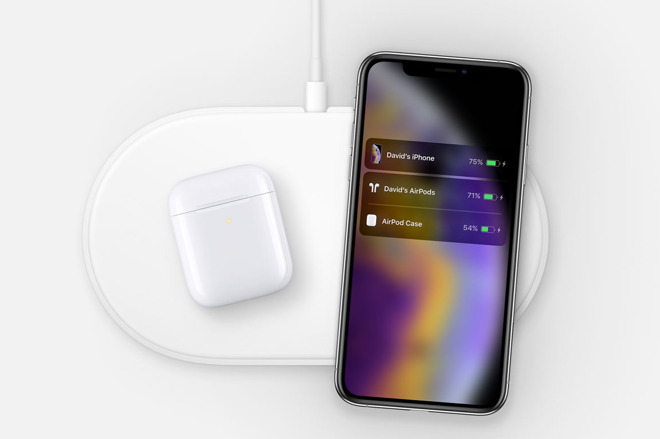 Apple has yet to announce a shipping date for its long-awaited and much-delayed AirPower wireless charging product but two signs in website source code point to it being imminent. 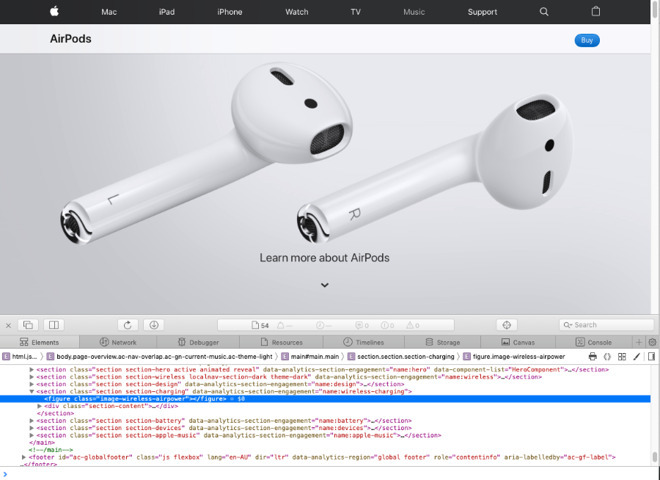 Twitter user Michael Bateman discovered a single reference to AirPower in the source code for the AirPods page on Apple's Australian website. The code for the same page also contains an as-yet not displayed image of the AirPower in use. This image is not present in Apple's equivalent page for the US and neither is the source code reference. The page is just the standard AirPods one but examining the HTML code underpinning it includes this one reference to AirPower. AirPower was first shown in 2017, but recent rumors point to it being released soon, possibly even this week. If so, it would join the plethora of hardware products Apple has launched in the run-up to its March 25 event. Uh oh, only 2 devices on the mat? I was very dubious that it would ever see the light of day, but it's looking more like the AirPower might actually arrive. The question is; do they release it with the rest of this weeks hardware releases, or do they save it for the event next week. It's hardware so I can see them wanting to push it out this week so they keep next weeks event just on streaming services. But it is a totally new product and I could see them wanting to crow about it on stage. But unless there's other hardware it would be an oddball one off. It will be an interesting week. Apple is DOOMED. They can't get anything right! Tim Apple should be fired! Dammit! I was going to say Apple was doomed! It will power 3 devices, but what about 3 iPhone XS Max phones? Don’t think they’ll all fit? What's the maximum power transfer and efficiency? The XS charges fastest with a 20W charger, plus another 25% lost in inductive charging would put the AirPower at 75 watts for 3 devices - I doubt it will be rated that high. I tried the scale on Illustrator you can't really fit more than 2 phones on the mat, even with the 'smallest' iPhone 8. I guess you can do 2 phones at 7.5w each or 1 phone and 2 small devices. It will definitely come with a 18w USB-C charger. The questions is: can you charge more than 3 Apple watches or Airpods at the same time?! Been looking forward to this but I also wish they made a charging only case sans battery that was much smaller. It’s an AirPods-specific page (hence the “Learn more about AirPods” text in the other image), showing how AirPods can charge on it. 4 devices - iPhone, AirPods charging case, Left AirPod, Right AirPod! I’m guessing, the most common use scenario for it was to charge your iPhone and AppleWatch, +/- AirPods, or a couple of iPhones. I doubt they were intending it to be used to charge the entire family’s iPhones at once, and as I mentioned above, the power requirements to do so would be enough that it would likely become limiting. There have been rumors/reports that power issues were what were holding up the release of AirPower anyway. It will be interesting to see how well it works, what the technology is, and if it would scale. The ‘dream’ that everyone keeps posting about wireless charging is that you could have a big mat on a table at the airport where everyone could set their phone to charge it. Of course if there were 20 phones all fast-charging at 20 watts, that would be 400+ watts of power. The other issue no one talks about is that most people want to use their phone while they’re sitting around at the airport, and it’s not very convenient to do so sitting flat on a power mat. Fretting over an imaginary scenario? So if it doesn’t work that way, people will just use the charger they have, or the increasing USB ports, etc.